Play out the battles of your imagination in Star Wars™: Destiny, a collectible dice and card game of epic, fast-paced duels for two players! In every game, you and your opponent command a team of iconic heroes or villains from throughout the Star Wars saga, using their unique skills to defeat your enemies. Each round, you’ll use your characters’ abilities, an assortment of large, premium dice, and a carefully constructed thirty-card deck filled with events, upgrades, and supports. You and your opponent alternate actions: activating your dice, playing cards from your hand, attacking your foes, and claiming the battlefield. You’ll need to prove your skills and defeat your opponent’s characters to claim your destiny! “Try not. Do… or do not. Star Wars: Destiny gives you the unprecedented chance to experience the Star Wars saga on your tabletop in full—from the opening crawl of The Phantom Menace to the final scene of The Force Awakens. In the game, you’ll command a team of iconic heroes and villains drawn from throughout the series. In a Separatist outpost on Mustafar, you may stage a battle that pits Luke Skywalker and Finn against Jabba the Hutt and Darth Vader. Or, you may travel to the snowy wastes of Starkiller Base for Rey and Han Solo to confront Jango Fett and Captain Phasma. 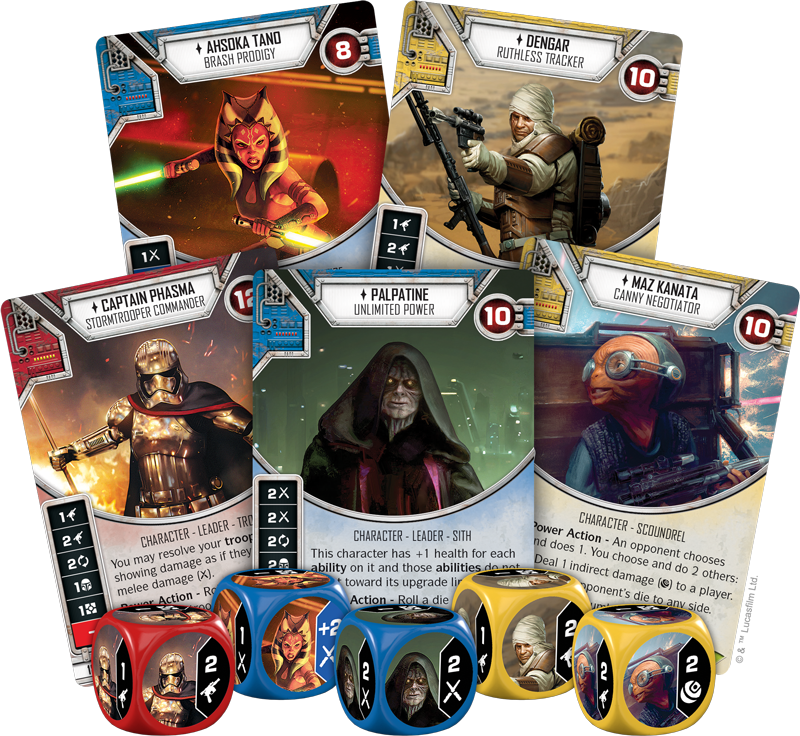 Star Wars: Destiny starter sets give you the foundation of a team and with randomized booster packs, you’ll be able to grow your forces and unlock new options for customization. 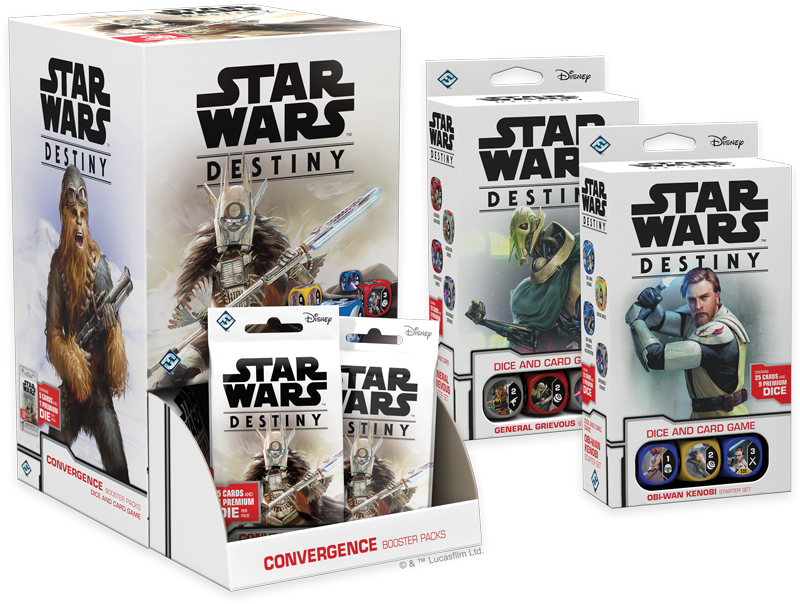 In every game of Star Wars: Destiny, you’ll face your opponent’s team of characters in a fast-paced duel. Whether you’re focused on your skills with lightsaber or rely on massed blaster fire to bring down your opponents, you’ll use your dice and the corresponding cards to outwit your foe and deal damage to enemy characters. 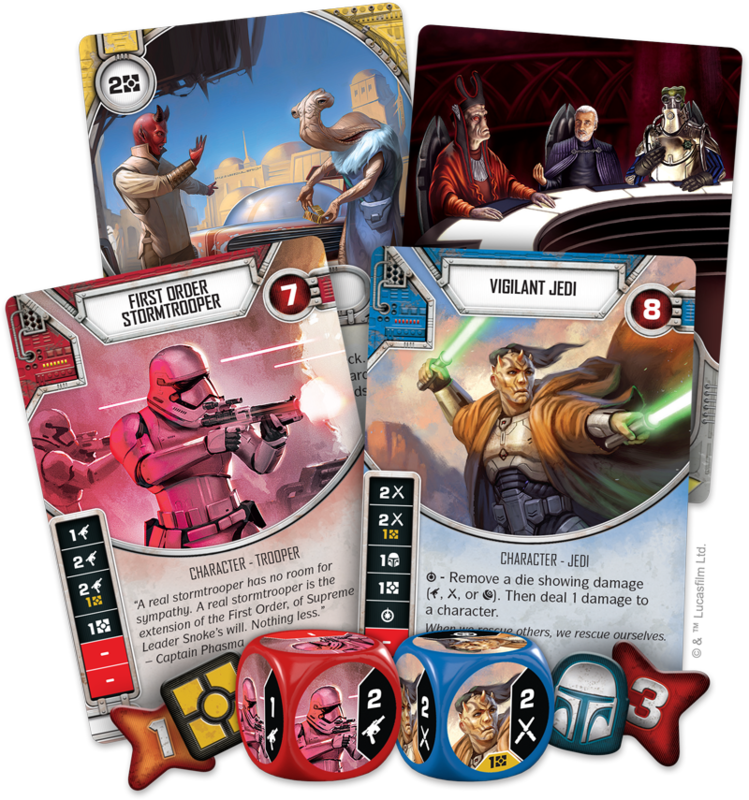 Ultimately, timing is everything in Star Wars: Destiny. You must choose when to activate your cards and when to build up your forces. You must choose when to press the attack by spending your dice and when to set up a larger move by playing an event from your hand. You even need to determine the right time to claim the battlefield and end your turn. 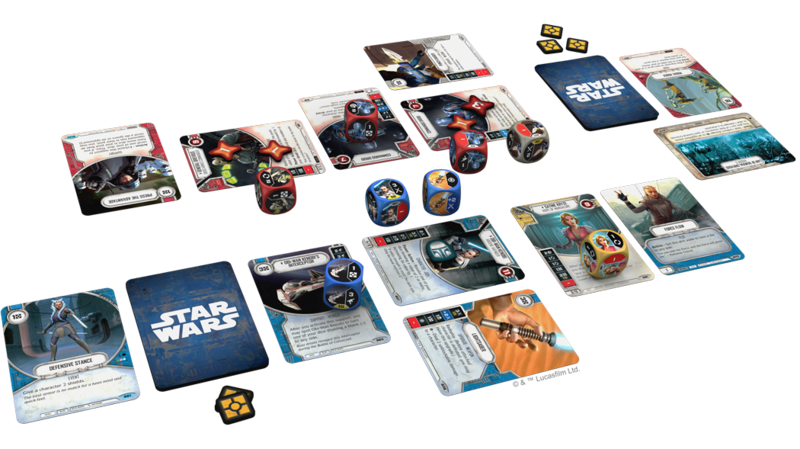 Though the rules of Star Wars: Destiny are easy to learn, you’ll soon see that its strategy offers massive depths. Build your team. Challenge your foe. Decide the fate of the galaxy!